Until recently, most riders' vision of a bike thief would be a shady character driving around in a Transit with bolt cutters and two burly mates. However, a new breed of criminal is now adopting a far less complicated, yet no less effective, technique to ride away on your bike. "It is only in the last year to 18 months that we have seen this style of motorcycle theft increase, so it is a relatively new phenomenon. There was an internet video of some bike thieves attempting to steal Ducatis from a bike dealer in Croydon in this way, and it was one of the first incidents of scooters being used to steal bikes," says industry expert Dr Ken German. Having run the now disbanded Metropolitan Police's motorcycle section of the stolen vehicle squad, Ken now works for the Motorcycle Crime Reduction Group (MCRG). As the UK's foremost motorcycle crime authority he advises both the motorcycle industry and Home Office on two-wheeled vehicle crime reduction. "The thieves ride around on scooters in a group and target a parked bike," explains German. 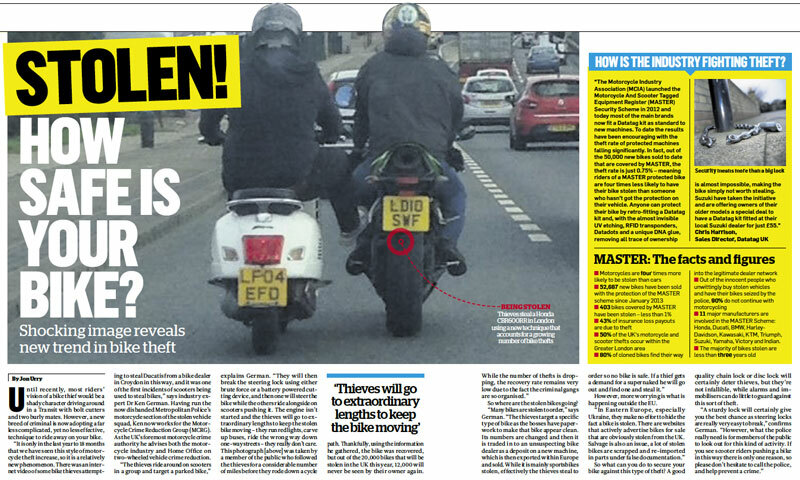 "They will then break the steering lock using either brute force or a battery powered cutting device, and then one will steer the bike while the others ride alongside on scooters pushing it. 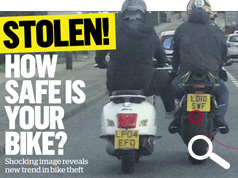 The engine isn't started and the thieves will go to extraordinary lengths to keep the stolen bike moving – they run red lights, carve up buses, ride the wrong way down one-way streets – they really don't care. This photograph [above] was taken by a member of the public who followed the thieves for a considerable number of miles before they rode down a cycle path. Thankfully, using the information he gathered, the bike was recovered, but out of the 20,000 bikes that will be stolen in the UK this year, 12,000 will never be seen by their owner again.While the number of thefts is dropping, the recovery rate remains very low due to the fact the criminal gangs are so organised." So where are the stolen bikes going? "Many bikes are stolen to order," says German. "The thieves target a specific type of bike as the bosses have paperwork to make that bike appear clean. Its numbers are changed and then it is traded in to an unsuspecting bike dealer as a deposit on a new machine, which is then exported within Europe and sold. While it is mainly sportsbikes stolen, effectively the thieves steal to order so no bike is safe. If a thief gets a demand for a supernaked he will go out and find one and steal it." However, more worrying is what is happening outside the EU. "In Eastern Europe, especially Ukraine, they make no effort to hide the fact a bike is stolen. There are websites that actively advertise bikes for sale that are obviously stolen from the UK. Salvage is also an issue, a lot of stolen bikes are scrapped and re-imported in parts under false documentation." So what can you do to secure your bike against this type of theft? A good quality chain lock or disc lock will certainly deter thieves, but they're not infallible, while alarms and immobilisers can do little to guard against this sort of theft. "A sturdy lock will certainly give you the best chance as steering locks are really very easy to break," confirms German. "However, what the police really need is for members of the public to look out for this kind of activity. If you see scooter riders pushing a bike in this way there is only one reason, so please don't hesitate to call the police, and help prevent a crime." How is the industry fighting theft? 9 major manufacturers are involved in the MASTER Scheme: Honda, Ducati, BMW, Harley-Davidson, Kawasaki, KTM, Triumph, Suzuki and Yamaha.